This is the first in a series of writings by Freya Cobbin, the inaugural Rogelio Salmona Fellow. Freya is currently in Colombia researching the work of one of Latin America's most important modernist architects, Rogelio Salmona, and the impact his work has had - and continues to have - on those inhabiting and using his buildings. The first two weeks have been spent orienting myself in the Colombian capital and discovering more about Rogelio Salmona by visiting many of his projects here; meeting with people who knew him well or worked alongside him; and those who have dedicated years of academic research on his architecture or periods of his life. The amount of information gleaned has been overwhelming and has left me brimming with inspiration. Furthermore I have been presented with many loose ends to chase over the following weeks, which has helped set some themes for the research ahead. I also met people who knew little or nothing about the renown architect but who are regular occupants or users of his built spaces; who have helped paint a picture of contemporary life in the city beyond the architecture establishment. This was a key objective of my initial research proposal and is beginning to describe the legacy of Rogelio Salmona in a plethora different of ways. Previously, Señora Rodriguez had lived uptown, but when three of her four children had moved out and onwards for their jobs/study, she decided to move flat and a place with a view was her absolutely priority. 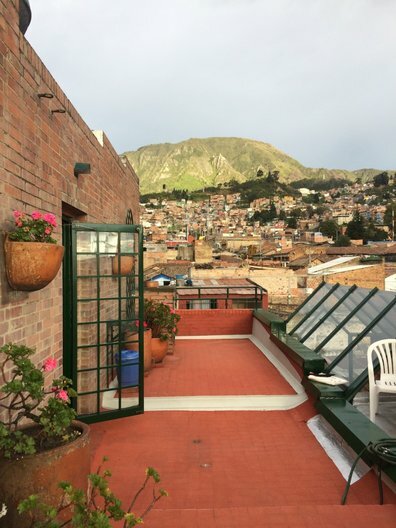 She has lived in the Nueva Santafé housing complex at the edge of La Candelaria for 30 years, and has not tired of the expansive vista over the sprawling city and hills beyond that encompass her rooftop terrace. Additionally the central location also serves her well and is very content although she now lives by herself. Initially the roof terraces were a shared commodity between the neighbours lucky enough to have the upper-most apartments. However Señor Rodriguez did not appreciate the dogs next door destroying her flowers and so she has fashioned her own divide to demarcate her side. Some of the other neighbours have also done the same thing in a manner of ways. She is also not terribly keen on the marijuana-smoking boys in the adjacent flat, and laments that there are no children to play in the communal courtyard. Families these days are shrinking, things are changing. However, something that has not changed since her arrival is the interior of her flat which has been left unaltered. She is thus able to present a realistic portrayal of how the apartments looked when completed in the early 1990s. David is studying philosophy in the Universidad Nacional and enjoys hanging out in the post-graduate building because there are so many different spaces to suit his mood. He loves that there are lots of stairs and ramps that lead up to the roof, more secluded niches between the structural bays and plenty of open space to move through. Although not all his friends have classes in the building many come here to spend their free time. It has just started raining so he has from the exposed terraces to take shelter in the large window frame that doubles up as a bench, protected from the elements by the overhanging canopy of the ramp leading up to the first floor teaching spaces. 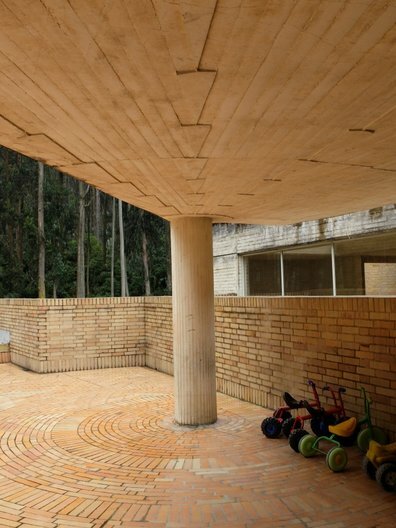 The family of Señora Murillo were some of the first inhabitants in the Jesus Maria Marulanda housing complex in the south of Bogota, completed in 1965 - one of Salmona’s earliest projects on his return to Colombia. She herself was born here and continues to live in one of the third floor apartments of the distinctive pyramid blocks. Technically, the buildings are ‘patrimonio’ (heritage) and should not be altered without permission, however most occupants have constructed their own additional enclosed spaces above their cascading terraces, creating a staggered profile to the clean triangular forms originally designed. Some have even knocked through windows on the side elevation. As a reprimand they have had their benefits frozen. Señora Murillo would like the Fundacíon Rogelio Salmona to design a uniform extension to the terraces so that the incursions may at least be regulated. She has not built over her own terraced area and enjoys the external space with a view oriented towards Monserrate on the horizon. 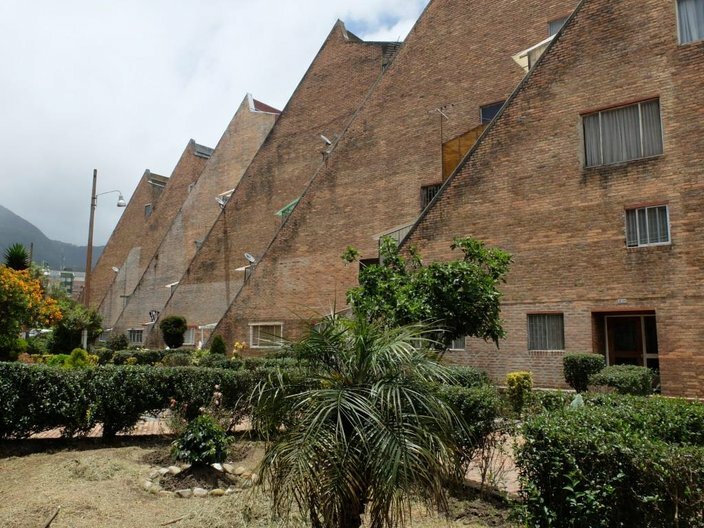 The ‘conjunto’ still serves as social housing, as was its original intent unlike many of Bogota’s other housing projects and she is very proud to be a resident. It is quite insufferable for Señora Castañe, who comes to work frequently in the National Archive, that there is no heating. Nor is there sufficient power plugs for the computers or other electronics that she is using today, and they refuse to fit any more because they cannot run more cables in a listed building! The bathrooms are also very small - it’s practically impossible to even turn around. And what a silly idea to design desks that don't fit the new chairs underneath. Or to put the desks on casters so that they move around when you’ve just got seated. 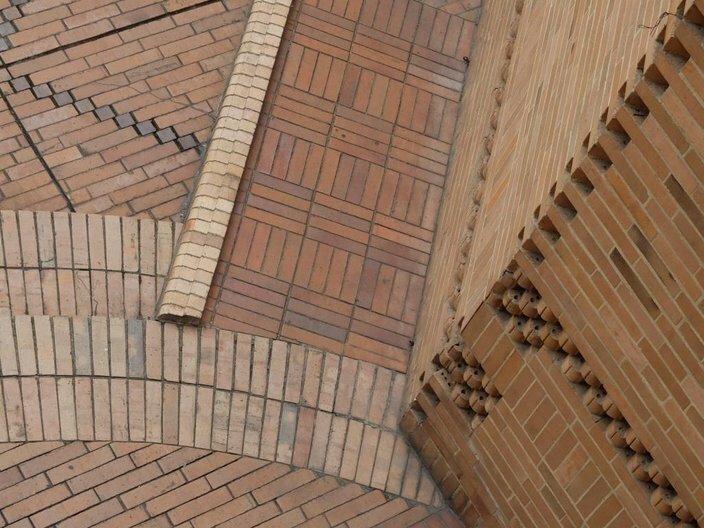 And what about all these fancy brick details in every corner? How are they going to fix them is they get knocked or damaged?! When the nursery school was being built, Marcela was tasked with recruiting local children to attend. This was initially a huge challenge because parents were sceptical of the new facility at the top of San Cristobal Sur. Free education including free meals for the children? This was hard to believe in one of Bogota’s most vulnerable neighbourhoods. Slowly she gained the trust of the local community and further afield, and the nursery filled its 300 places. Today it is much loved by the staff, children and families alike, and they are all very proud to have such a wonderful facility. Marcela took particular interest throughout the construction process and documented it through many photographs herself. 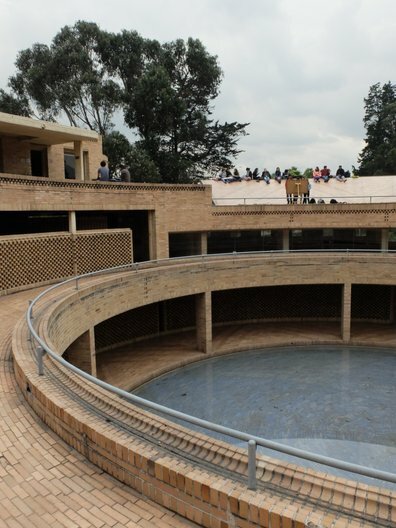 There were challenges with building at the top of a very steep hill, and although the project was generally moderate in price, some expense was spent to resolve small details such as perfecting the formwork of the faceted columns and dovetail ceiling details. Even so, the value for money beyond the price per square metre is really in the low maintenance cost resulting from the use of high quality materials as now the building is very easy to look after. It has been a wonderful investment for this community. When Os arrived in the city from Choco, not only had he never seen a tall building before made from bricks and glass, but was terrified of taking an elevator. He had to get over that pretty quickly because his first home in Bogota would be on the 20th floor of the Torres del Parque, overlooking the whole city. It took some time to get used to the plummeting view outside and feel brave enough to approach the windows, especially seeing the fierce wind sway the palm trees outside at night. But when he eventually did the payoff was worth it. A direct view over the plaza del toros below was better than a front row season ticket to all the cultural events being hosted there. 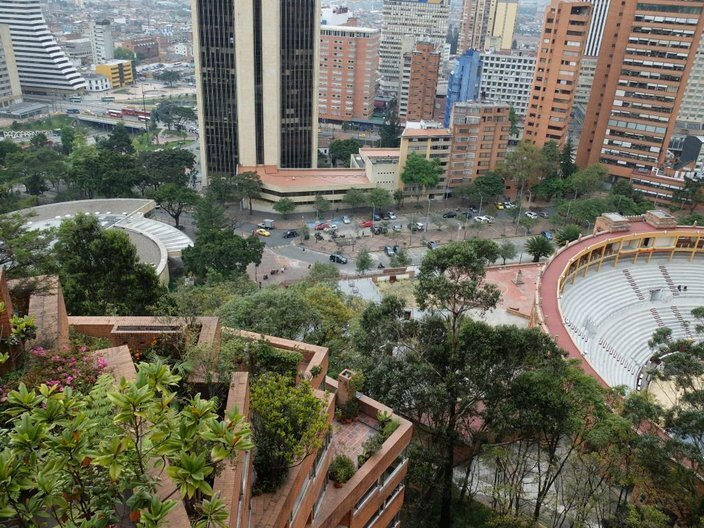 The adjacent landscaped staircases that connect the towers to Bogota’s most historic park, Parque de Independencía, designed by Salmona in tandem with the residential project was the first urban park Os visited. The towers were a fun place to live, filled with students, creatives and young professional, there were lots of parties. He would enjoy walking around the neighbourhood, especially going to the mercado La Perseverancía for cheap and filling meals. Now the tall buildings don’t bother him, but he has since moved house and now resides on the first floor.